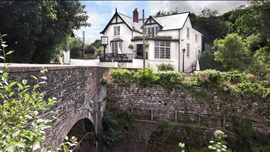 You can't fail to notice this handsome, white-painted coaching inn right at the heart of Raglan village, between the Wye Valley and the Vale of Usk. It's been dispensing hospitality of one kind or another for more than 500 years, although the interior brings you nearer to the present day with its rippling glass, design-led furnishings, cosy corners and slate floors. Since the current team took over in 2002, the Beaufort Raglan has gone from strength to strength, with food now high on the agenda. Real ales and light meals are served throughout the day in the beamed lounge bar, where the casual menu promises sandwiches, paninis and the likes of home-smoked chicken Caesar salad, fish pie and faggots with chips and pea purée. The full menu served in the brasserie-style restaurant works its way through more ambitious offerings including confit of rabbit with Savoy cabbage and wild mushroom consommé, Cornish crab linguine with mussels and Pernod, and desserts such as the 'coffee collection' (tiramisu, brûlée and sorbet). Twelve wines are available by the glass on the well chosen list. Chef's soup of the day served with bread and butter. with chilli, garlic and olive oil. Served with a garlic butter. Served with thinly sliced toasted French bread and chutney. Steamed mussels served in a white wine, parsley and butter sauce finished with cream and served in an authentic moules dish. Served with garlic and parsley butter. Served with a salsa verde. Slices of tender, cured Pata Negra jamon served with baby beetroot and gherkins. Served on a toasted muffin with red onion marmalade. Marinated with fresh beetroot and lime and grated horseradish. Cured Spanish chorizo pan fried in cider. Lightly floured and deep fried. Served in a saffron, chilli and garlic butter. Served with a red wine and garlic jus. Grilled asparagus, sautéed Mediterranean vegetables and garlic mushrooms. wrapped in pancetta with a saffron and garlic butter sauce. Served in a red wine and garlic jus. Served with your choice of sauce from the selection below. with your choice of tomato salsa or green pesto. with guacamole and sweet potato fries. A spiced coconut and bell pepper sauce. A creamy blue cheese, white wine and mushroom sauce. All mains are served with a choice of jacket potato, new potatoes or chips. £16.95 for one, £29.95 for two. Seared and finished in the oven. Baked whole or filleted and served with a garlic and parsley dressing. Served with a saffron and garlic butter. Fried in a tempura batter or grilled. Or take a look at our fabulous fish counter and choose your own whole fish or lobster (subject to availability). Choose from strawberry, mango or apple & cider. served with crackers, celery, chutney and apple. Homemade meringue, whipped cream, berries and coulis.